It’s almost time to vote again! YAY! Even more exciting, it’s two votes in one! We’ve got an referendum question on the ballot this year – the single transferable vote (STV). It was also on the ballot in 2004, but we’re giving it another shot after a narrow loss. This Wednesday night seems to be THE night for electoral shin digs in Van. Starting with the launch of BC Vote, a new non partisan source of news for the upcoming election. Then moving on to the STV Debate – will be a great debate between Antony Hodgson and Bill Tielelman. I’ll be hitting both events with Get Your Vote On stickers and voter registration forms on hand. Transit between events is super easy. Want to know more about STV? Join me at the STV Debate on Wednesday night, sponsored by COPE. “Is STV right for BC? A debate on STV and electoral reform in our province – THIS WEDNESDAY! We can change business as usual. We buy things everyday. Businesses will do anything for money. Businesses will do anything for our money… so why don’t we use that power? To use our purchasing power requires organization, and until the Carrotmob came around, groups hadn’t seen ‘our money’ organized on a grassroots level successfully. We took the concept to Vancouver, and we’ve called it the PodMob*. *Pod – group of Vancouverites. Mob – the act of organizing our purchasing at one place and time. The concept: A big group gets together and agrees to buy things at one place and time. Now, we have pooled our money into a large sum we can use to negotiate with. Negotiate what? 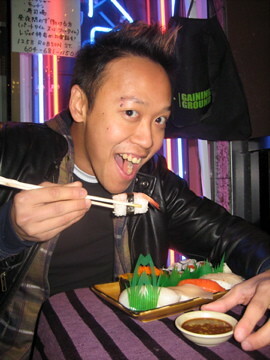 Vancouver is full of sushi – the West End alone has over 20 sushi spots. I can’t convince a sushi restaurant to drop farmed salmon from their menu or start composting scraps by threatening not to purchase a $10 sushi combo. But a group of 100, 200, or 300 people that stop in for sushi on a particular day does have enough combined money to persuade a sushi restaurant to step up to our challenge to green their restaurant. Green your operations (i.e. energy efficiency, water conservation, waste management, and purchasing/supply chain). Label your menu so we know what items are sustainable (based on the Seafood Watch Sustainable Sushi Guide). Offer at least one “Best Choice” item from the Seafood Watch Sustainable Sushi Guide. What does ‘greening your operations’ really mean? The Green Table Network heard about the PodMob and stepped in to offer a one-year membership to the business we PodMobbed. They are experts in greening the hospitality industry, and their membership provides tools, guides, and a great network. The Seafood Watch Sustainable Sushi Guide bases it’s ranking of ‘sustainable fish’ on the state of natural stocks, fish farming practices, harvesting methods, and health concerns (i.e. PCBs and mercury). It all started on a rainy November day. I walked into almost every sushi restaurant in the West End, and told them I would bring them a mob of paying customers if they committed the highest percentage of one day’s revenue to ‘greening’ their restaurant. 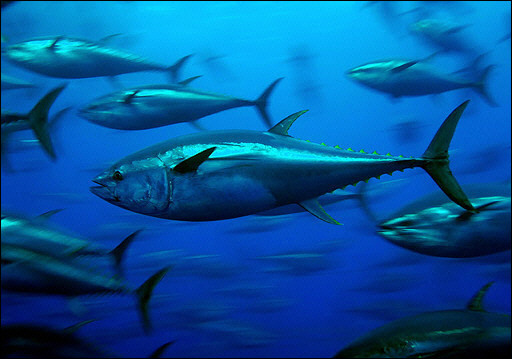 Considering the state of the fish stocks across the globe, we also asked the restaurant if they would spruce up their menu with some sustainable sushi options. A handful of restaurants stepped up to the challenge and wanted to dig their teeth in and learn more. The top bid came from Sushi Bento Express at 31% of revenue from November 20th. I met a girl while I was canvasing the sushi restaurants that thought her boyfriend, Simon, would totally be into lending a hand. So I met up with Simon, who works at Change, about a week before the PodMob. He also introduced me to Lorien, from Limelight Events. Between the two of them we handled a whole bunch of last minute things that I hadn’t had time to think about and designed some awesome posters! We pulled together a great night that harnessed West Enders’ purchasing power to create change in a local business.The PodMob was a success! the chance to speak with Mike McDermid from the Ocean Wise program on BC Almanac with Mark Forsythe. Jackie Wong wrote an article in the WestEnder that featured our story on November 20th. Sushi Bento Express put together a sustainable sushi combo menu just for the day. 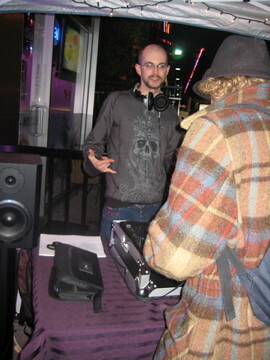 Shah DJs pumped out awesome tunes. 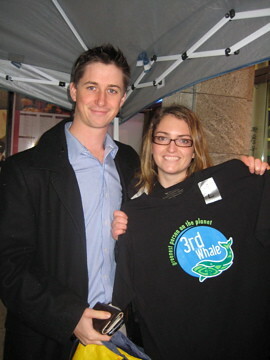 Boyd, our sponsor from 3rdwhale.com, asked trivia questions and gave out bamboo t-shirts. Tiny Bites popped in to review the sustainable sushi scene. 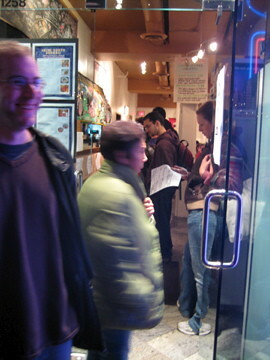 An intrepid trio from Bowen Island even made the trip across the drink to munch on guilt-free sushi. Of course, there was also a mob of West Enders that kept the Flores brothers busy all night. We’ve got pictures to prove it! What impact did we have?? Drum roll please…..
Over 100 Podmobbers on the scene. 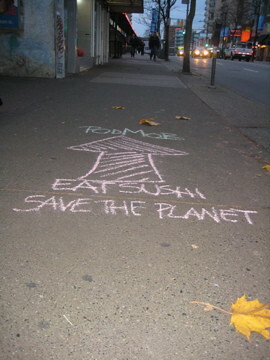 Sushi Bento Express upped their contribution to ‘going green’ to 33% – they rock! The Flores brothers were amazed by how many people showed up for the PodMob, and they’ve decided to keep the sustainable sushi combos on the menu full time. They’ve also committed to labeling their menu with green, yellow, and red dots so you can make informed choices, and exploring Ocean Wise Certification. Where did the PodMobbers come from? Some saw our youtube videos, got an email, saw a poster, facebook, or heard about it from a friend. 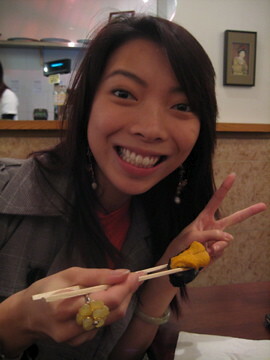 Eat sushi. Save the ocean. With an introductory meeting with the Green Table Network under their belt, the next step is an audit. A Green Table representative will spend half a day at the restaurant observing how things run, and then they will be able to compile a list of suggestions. This is where energy efficiency, water conservation, and waste management will improve. Eat sushi. Save the climate. We’re going to keep tabs on the changes that happen at Sushi Bento Express, and report back what the impact. How many kilowatt-hours, liters of water, and kilograms of waste are diverted? Stay tuned! Eat sushi. Save the planet. Congratulations to everyone that came out and participated in the PodMob! You rock! Ocean Wise – initiative out of the Vancouver Aquarium that promotes adoption of sustainable seafood in restaurants. Seafood Watch – consumer guide out of the Monterey Bay Aquarium (American). Sea Choice – Canadian consumer guide. How does Ocean Wise define sustainable seafood? What is the Ocean Wise Program? Ocean Wise is a free voluntary program for restaurants that want to serve sustainable seafood. The whole menu doesn’t have to make the switch, but at least one unsustainable item has to be removed or replaced (every six months), and sustainable options highlighted so customers can clearly identify ocean-friendly choices. The Vancouver Aquarium lists participating restaurants in their Ocean Wise directory, provides training sessions for staff, media resources, and access to an extensive network of chefs committed to sustainable seafood. Check out the Ocean Wise Restaurant Directory here. Sushi Bento Express is going to offer sustainable sushi options, and they’ve agreed to labeling their menu – they’re only a few steps away from being Ocean Wise! I’m going to bring the information that I have on Ocean Wise to the folks at Sushi Bento Express – maybe they’ll take those last steps and be the first small sushi spot in Vancouver to be Ocean Wise. I’m really excited that the Green Table Network (GTN) has donated a one-year membership to Sushi Bento Express for winning the PodMob. 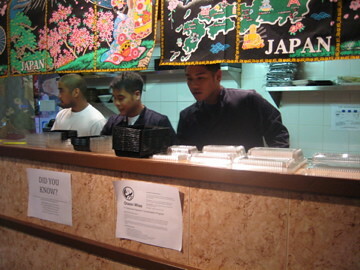 The membership will provide the folks at Sushi Bento Express with tools and guidelines for greening their restaurant that are based on local and international standards, and tailored specifically for restaurants.The GTN provides guidance on solid waste management, water conservation, energy conservation, pollution prevention, and purchasing. They’ll also get access to advice and support from GTN Green Experts, a network of wicked local suppliers that have greened their own operations and products. From what I understand, the membership that Sushi Bento Express is receiving will not qualify them as “green,” and they’ll have to meet specific criteria to be publicly listed as a GTN Approved Member. They’ll be able to use the assessment tools that GTN provides or hire an auditor to determine what changes need to be made and create an action plan. If Sushi Bento Express meets all these criteria, they’ll be listed publicly as a GTN Approved Member, and then audited annually to ensure that they’re keeping up with their green initiatives. The combined waste, water, and energy savings of all 65 operators signed on with the GTN is impressive! With everyone’s support this Thursday, I think we’ll give Sushi Bento Express plenty of incentive to go for GTN Aproved Member status! Click here for the link to my recent interview on CBC’s BC Almanac. Mike, from the Ocean Wise program at the Vancouver Aquarium, was interviewed after me and he even took questions about “sustainable sushi.” The full show can be found here.